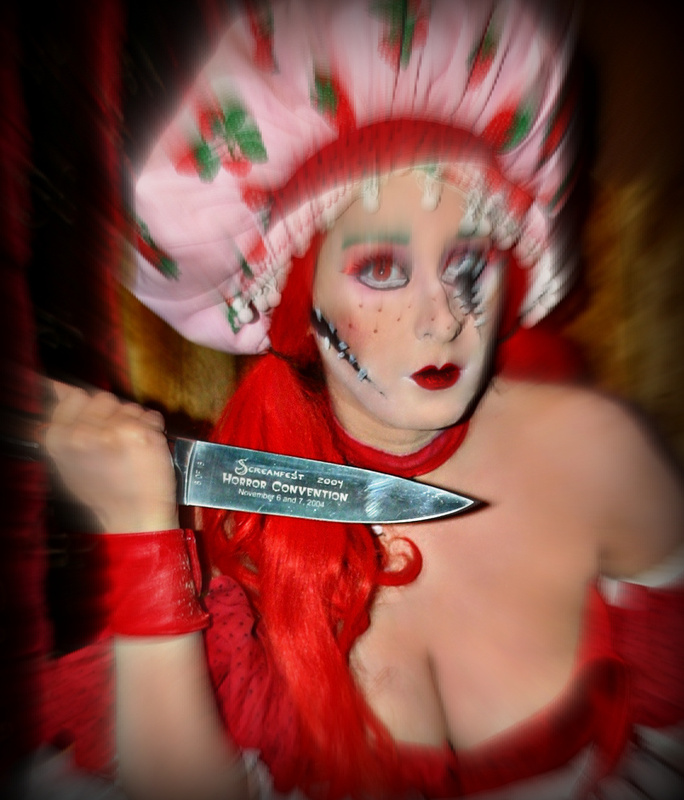 Dementia Grimm: September 2012’s Devil Girl of the Month! Primal Root: First of all, your spread is ridiculously cool. I really dig the costume and make-up, where did the concept for this spread come from? I can’t tell if you genuinely love or hate strawberry’s. 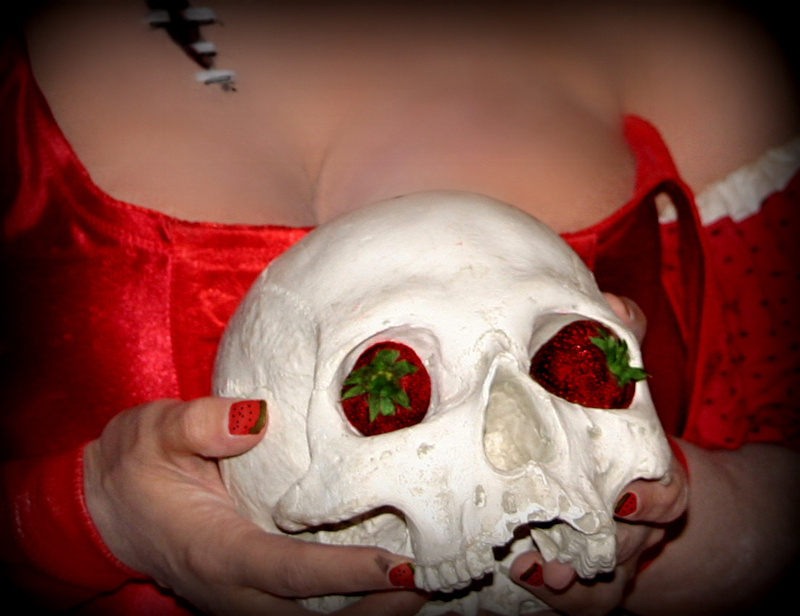 Dementia Grimm: To be honest, strawberry *is*, and has always been my favorite fruit, but that’s not where this all started. A few years back, Penny Arcade ran a parody piece called “American McGee’s Strawberry Shortcake”, playing on the “Alice” variant. I thought the piece was twistedly adorable. Turns out American Greetings wasn’t so happy, and they gave Penny Arcade a cease & desist order, and it turned it into this huge ridiculous internet thing. I figured, just on principle (and it *was* a cool idea), I wanted to do the costume. I’d done it for about three years at Dragoncon, and it was then retired. Lately, she’d been on my mind, and I started trying to figure how I could revive her but in a horror-style fashion. I don’t recall the video I was watching, but I was browsing Youtube, and suddenly remembered the Strawberry Shortcake doll I had as a kid, and how it always kinda creeped me out, even though I loved the smell of it. The idea snowballed from there. 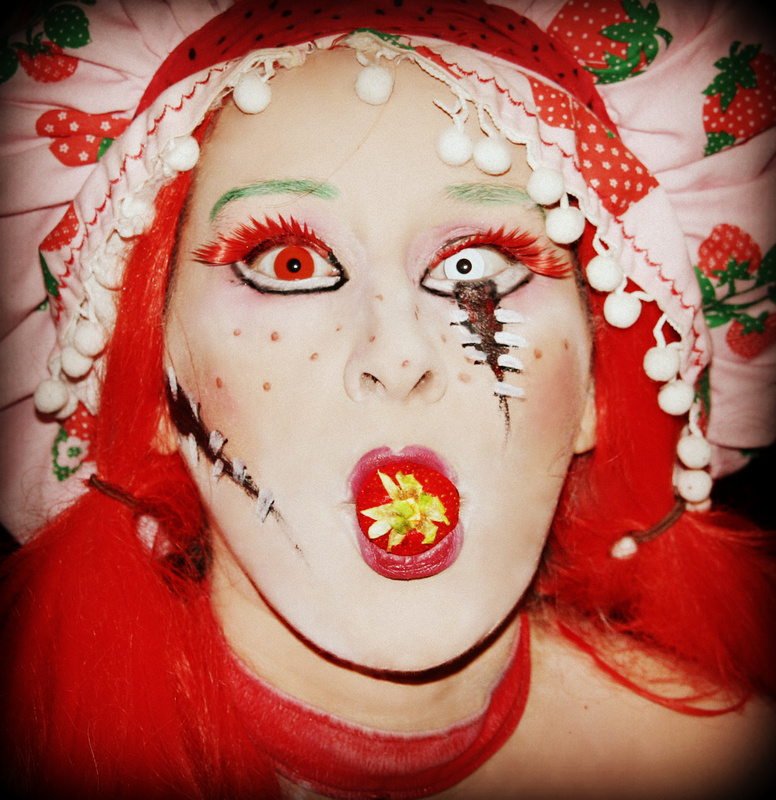 PR: Dementia, we’ve heard through the grapevine that you will be participating in the Girls of the Con 2013 Calendar. Can you tell us what you have in store? Which month are you hoping for? DG: Thank you! I am really incredibly excited and honored to be working with GOTC (http://www.girlsofthecon.com/_, really such an awesome group that really embodies the spectrum of beautiful women who attend conventions. I know how cheesy that sounds, but it is absolutely true. I believe they have me as Miss April, as my costume is that of a huge pink rabbit with a chainsaw. The story behind the costume is that it’s a variant of Dogwitch (http://www.dogwitch.com/), a demented comic from the incredible mind of Dan Schaffer. In the Direct to Video TPB, Violet (Dogwitch) conjures up a dead guy, for her to have a date with. Her idea of a date is to dress up in a giant bunny suit and play “Skin the Rabbit”. Heck of an Easter story, doncha think? So, I think that’s why I’m Miss April. Oh yeah, and there will be copies and I’ll be at their table at Spooky Empire’s Ultimate Horror Weekend October 26-28. Maybe even in the giant bunny suit. PR: It’s almost here, the most wonderful time of the year, Fall! Halloween season! Do you have any traditions? DG: Traditions? Oh yes, many, Many many many. It’s not fall to me until I have my first Starbucks’ caramel apple spice, or have my first Publix cinnamon broom up in the house. I also have my awesomely epic playlist in rotation on Spotify. I also, when I feel that familiar breeze in the air, make a bit of a ceremony of solitary communing with Mother Nature and honoring the season. At the beginning of October, since 2004, I have a yearly ritual going of picking a new horror movie every night, that I have not seen before, and watching & reviewing it. A “30 Days of Horror”, if you will. Some of my favorite horror films have been because of this challenge. Netflix is an invaluable tool in this. I’ve done it on Livejournal, I’ve done it for websites, last year I did it on Google Plus, and this year I may do it on Youtube. I’m actually starting to search for great options for my selections now. PR: Any events this Fall you’re looking forward to? DG: ALL THE EVENTS! Seriously, there are a number I’d like to do. I think I’m able to make Halloween Horror Nights at Universal at the end of this month. I would LOVE to do Disney’s Halloween event. I’m also pondering a ghostly-related event to squeeze in there as well. I’m not sure what, just yet, but I’m big into the supernatural and I haven’t done one in a while. 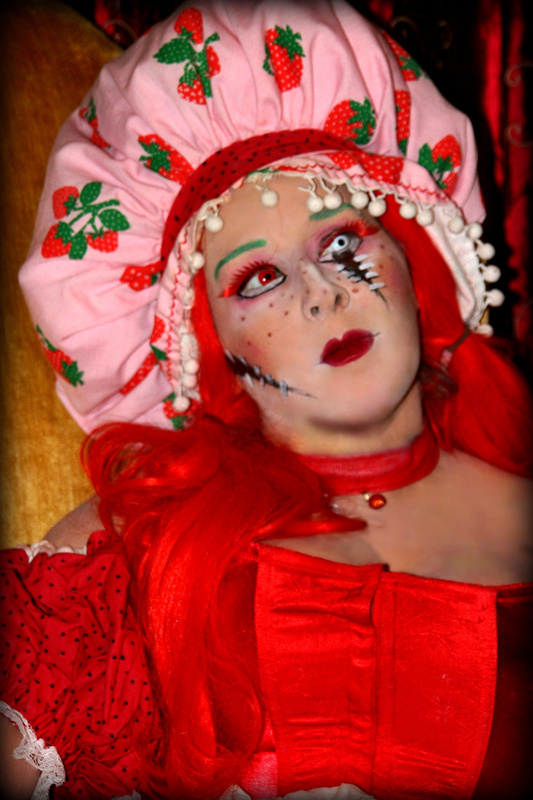 I was also invited to Zombicon in Fort Myers, but am not sure if I’ll be attending. I’m also still not sure about Halloween. 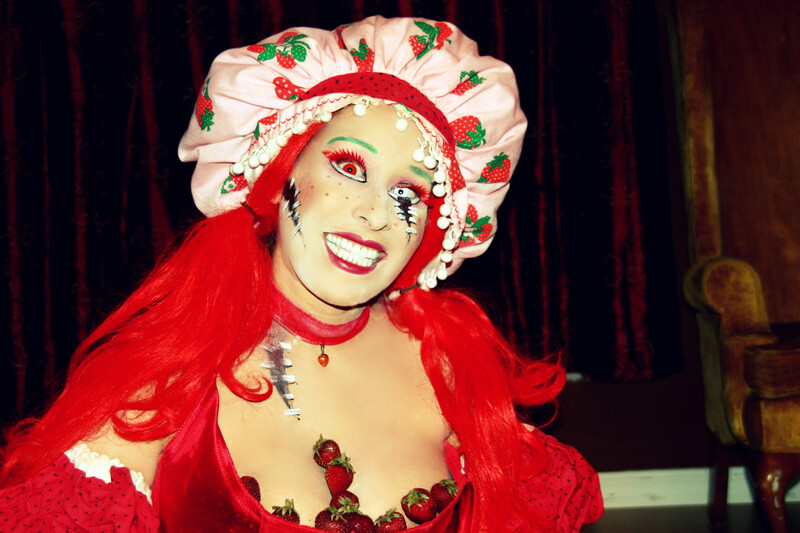 I’m super excited about Spooky Empire’s Ultimate Horror Weekend, where I’ll be wearing Strawberry in all her red glory, and after that I may just stick to scaring my Wonder-bread suburban neighbors as I usually do Halloween night. Maybe a party or two. I’m open to suggestions! PR: I want you to sit back and relax for a second. Take a look deep within yourself and share with us what movie you truly enjoy that most people consider Trash. If this is too personal, we will strive to be understanding. DG: That’s a really good question. I’d like to go with the answers of “The Blair Witch Project”, since I grew up in a small town surrounded by woods chock full of similar urban legends, or “Paranormal Activity” since I’ve experienced similar things, but those answers seems so cliche. It would be so much easier to ask what horror movies I hate that everyone else likes, but that would take up a whole blog to do so. WHYTHATHORRORMOVIEYOULIKESUCKS.COM. OH! I know one! A little gem from1989 called “Dance of the Damned”. I adore vampire movies, and this one isn’t your typical vampire-action bloodfest. It’s, in my opinion, a beautiful piece that was one of the first of its kind to showcase vampires in a different light. I’m sure I have a few others, but I can’t think of them off the top of my head. PR: Dementia, again, we are honored to have you as our Devil Girl of the Month for September. Do you have any words of wisdom to the folks checking your spread out at home? Any closing remarks? I think the Crypt Keeper would be proud! Gang, enjoy the latest spread from Dementia Grim! Stay Trashy!